A ladder can totally make an awesome side table. An old door can be an awesome headboard with a little refurbishment. Use an old bed frame to make an awesome bench. Old entertainment centers can be bulky and not compatible with your new flat screen TV. So, just pare it down to the essentials so you still have a console and storage space without having all that unnecessary bulk. You can still use those pieces of baby furniture once your kids grow up. Try making one into a chalk table! Make your cooler rustic by adding some pallet wood. Covert a bookcase into a fun play station for your kids. Great indoor or outdoor accents, these tables combine the man-made with nature. Don’t put the crib in storage, convert it to a toddler bed! 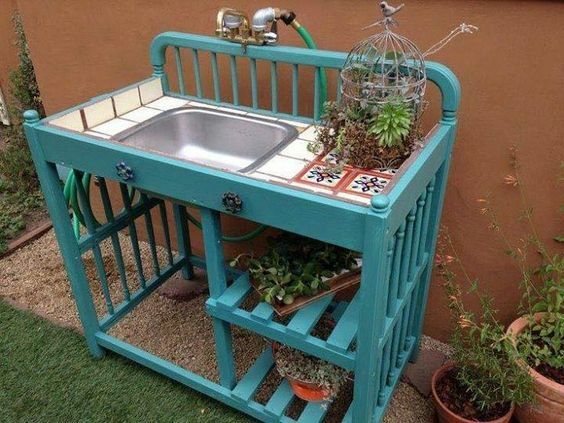 Or convert the crib into a potting bench. Hang some old drawers to make fashionable and functional shelves. Don’t let these ideas go to waste. Share them (and this page) with your friends!